I used this creature as the killer in a murder mystery I ran many years ago. I present it here in a very brief form -- feel free to add NPCs and clues as the case may be. How Anaf came to be will forever remain a mystery. Perhaps he was the imperfect creation of an irresponsible druid who didn’t have the courage to face the consequences of an unsuccessful awakening. Maybe he was given a terrible mockery of sentience by some minor deity as a cruel and twisted joke. Possibly he is the byproduct of an irresponsible magic experiment. Probably, no one will ever know. The only thing known for fact, is that a few decades ago, an old oak that has stood in the forest for centuries suddenly awakened, becoming an extremely powerful, but dim-witted creature calling itself Anaf, or “branch” in Sylvan. This gentle giant was quick to catch the attention of the children of a nearby lumberjacking community called Horesh. 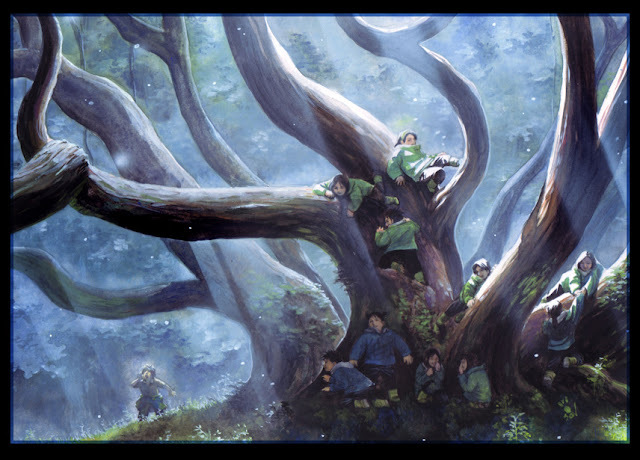 Once realizing that Anaf, for all his strength and size, was harmless, the children spent hours every day playing with the friendly living tree. Anaf was barely aware of the fact that the children of Horesh were playing with him, but he was happy that some activity took place beneath his age-old branches. But his pleasure was short-lived for when the children grew up, they abandoned the old tree and went about their lives, forgetting all about their childhood “toy”. The “toy”, however, did not forget about them. Anaf longed for living things to come and play with him. For many years he brooded quietly, mumbling to passing birds and small animals about his sadness and loneliness, waiting for the children, the only pleasure of his simple life, to return and play with him. One day, a small boy approached the unusual tree, but the potentially happy event has turned into a terrible tragedy as the clumsy Anaf, in his joy and excitement, accidentally crushed on the child and killed him on the spot. 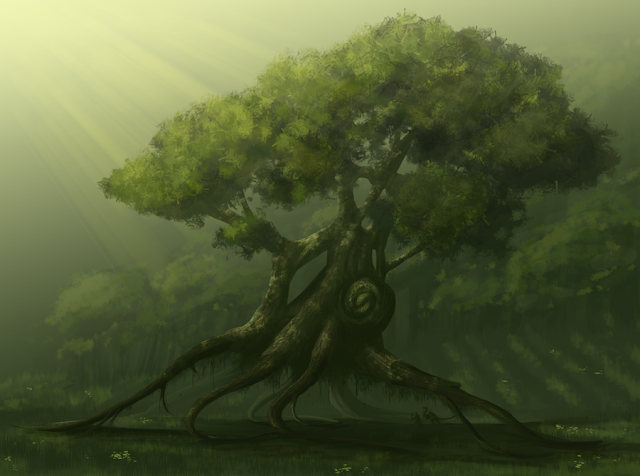 Anaf is a massive evergreen oak, not different from a thousand other oaks that grow in the forest of Horesh. Unless he is moving, there is nothing about his appearance that suggests his awakening. When active, Anaf behaves like a mentally retarded man; he is not evil per se, but he is too stupid to grasp the consequences of his actions, or the severity of the damage he can cause with his immense bulk and inhuman physical might. Concepts such as death, pain and sorrow are beyond him, although he does have a sense of self-preservation. Anaf speaks slowly and without emotion, often losing the thread in mid-sentence. He tends to twist words and muddle their order in the phrase. For all his stupidity, Anaf still has a strong self-preservation instinct and is terrified of fire and axes (as all trees are). Whenever he is damaged, he flies into an insane rage, howling senseless curses and beating everything in sight with a 20-foot-long log that he uses, rather crudely, as a club. His great power and lack of restrain make him a very deadly foe even for experienced fighters. The PCs may be hired by the terrified people of Horesh to locate and destroy the mysterious goliath that slaughters villagers with such monstrous strength and barbarity. Initial investigation will show the victims were all killed by being struck with a huge club by someone with immense strength, however, except for dragging marks on the ground, there will be no tracks to follow. The best hopes the PCs have of solving the crimes is using detect magic in the area, possibly after questioning woodland beings, or digging into the past of the village.A more risky venture is using a harmless-looking bait, a dangerous experiment since even one blow from the tree can kill a low-level PC. DMs wishing to make this adventure more challenging may scatter red herrings in the form of nearby giants, a club (actually a broken branch) used for the killings, or trees that seem to shift occasionally, implying the whole forest might be witched. The PCs can also meet the dumb tree accidentally as they are walking through the forest on some other errand. Because they are far from defenseless children, it is unlikely that he will attack them, but he may be interested in sharing his woes with the PCs. Experienced druids and rangers may befriend Anaf and use his great force to battle evil, but they should be careful not to get lynched by the vengeful people of Horesh who will not forgive the murder of their children and husbands that easily. Very nice and creepy. May have to use this sometime. I am in awe at the resonant tragedy of this idea. Messed up stuff. Seeds of a swell short story here.